Published June 2, 2017 By Anna T. This post may contain affiliate links. Regardless, I only recommend sites I've researched and/or used and trust. Maritz CX is a company that conducts surveys on behalf of major corporations. While they do have multiple call centers located in the US and in the UK, they also hire home-based interviewers. If you are looking for a work from home phone job doing outbound calling (not sales-related) where a land line is not a requirement (although it is preferred), this might be a good fit for you. It does appear that the home-based positions are US only. Working for MaritzCX involves conducting surveys for major corporations as mentioned above. The calls are done through an automatic dialer so you aren't actually dialing the numbers yourself. From what I've read, it's simple work where you just read the questions off from a scripted survey and key in responses numerically as you receive them. There is no selling. A quiet background is a must. Most current workers claim this is very easy work and that the surveys are short, usually lasting no more than a few minutes. This is good because most people don't want to be kept on the phone. You work for MaritzCX as an employee, not an independent contractor. Benefits include paid time off, employee referral program, and bonuses/incentives. Many people who currently work for this company use Skype, Google Voice, and even use their cell phones to work from home, so you don't have to have land line. However, it does say in their job description that a land line is preferred. Note that if you opt to use your cell phone, you'll need to make sure your headset can plug into it and that you have unlimited minutes because you'll be on the phone for at least four hours at a time without hanging up as the calls come in through the dialer. It's also important that you have broadband internet, no dial-up. You will also need a computer with Microsoft Office and use Internet Explorer 5.0, Safari, or another up-to-date, compatible web browser. MaritzCX will start you out at your state or county minimum wage, but there is potential regular pay increases. After one year, you could be earning $1.25 over what you started out at. Your pay comes weekly on Fridays with direct deposit. The pay period runs from Saturday to Friday and you will always be one week behind on your pay. Every month you can qualify for bonuses and extra little incentives, such as gift cards, based on your performance. If you are hired, you'll have to commit to at least 20 hours per week and not more than 28 hours per week. Working on the weekend is a requirement for every worker. You can choose to do either six hours on Friday, four hours on Saturday, or three hours on Sunday. *If you're in Pacific Time, you work 1-6pm M-F, for example. Your schedule will be based on project availability. After you apply online, you may hear back with an invitation to do a phone interview. The company gives you some options for days and times, and you let them know what interview time would work best for you. It could take anywhere from a few days to a week or more to hear back about getting an interview. 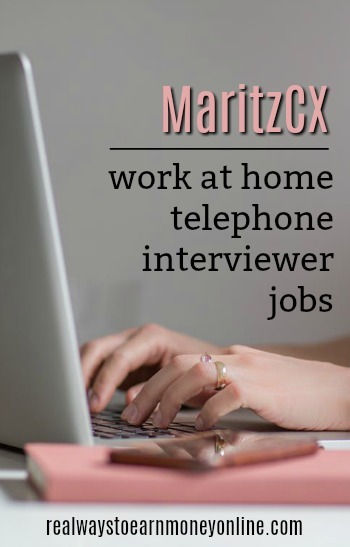 MaritzCX workers claim the phone interview is pretty easy to get through, you just talk to someone and you also do an assessment over the phone. It could take another week or less to hear back after your phone interview to find out if you got the job. If you do get the job, they will mail you some new hire paperwork to fill out that you will need to have notarized and then mail back to them. Before you can actually start working, you will also have to go through training. There is a paid eight-hour orientation you'll go through if hired, along with two full days of training. The staff gives feedback and tries to answer questions in a timely manner. While many people say the work is consistent, it is project-based. This means the project you're on could end unexpectedly and you may have no work for a while, or indefinitely. There was a comment left below where this happened to someone, so I would recommend having another earning opportunity on the backburner just in case. I've been reading through forum threads on various work at home sites, and the workers there seem really excited about the job and very happy with it. Pay seems to be timely and the people are, from what I've read, easy to deal with. There are several other reviews posted at Glassdoor.com, where MaritzCX received 3 out of 5 stars based on anonymous employee reviews. While the pay starting out is not a lot for most people, the weekly pay is a plus and apparently there are opportunities for bonuses and incentives. Lots of people are also glad that this is an employee position rather than something you do as an independent contractor, so you don't have to worry about holding back income for taxes. You can go here to apply for this position. Note that as of the date of this blog post, it appears to be open, but this may not always be the case. Good luck! Please comment below if you have experience with the company you would like to share. I recommend trying out a subscription to FlexJobs if you are looking for more legit work at home opportunities. I have been a member for two years, and I love it. Their jobs are updated almost daily and are focused on flexible/work at home opportunities. Each listing is hand-screened so the company is able to guarantee no scams. A one-month subscription is $14.95 and you can cancel very easily at any time if you're not impressed. Use promo code AFFILPROMO to get 30 percent off of that price. This post originally published July 25, 2013. Updated and re-published June 2, 2017. Thanks for putting this together for us Anna. You know I’m passing this along! Have a great day and weekend! Thanks so much, Cori! You do the same! Are you looking for a rewarding career that puts you at the forefront of the technology or customer experience (CX) industry? Join the biggest customer experience company with 18 offices worldwide. Become part of an innovative organization that’s combining cutting edge technology with industry-leading research capabilities to create something new. Enjoy the benefits of a fun, positive, and dynamic work environment that encourages creativity and rewards results. MaritzCX believes organizations should be able to see, sense and act on the experiences and desires of every customer, at every touch point, live. The company helps organizations increase customer retention, conversion and lifetime value by ingraining customer experience intelligence and action systems into the DNA of business operations. MaritzCX serves many of the world’s top companies in industries from automotive, financial, retail, hospitality and healthcare. •	MaritzCX President and CEO Carine Clark has been named CEO of the Year by Utah Business magazine. •	TMC, a global, integrated media company, has named the Allegiance platform as a 2015 CUSTOMER Magazine Product of the Year Award winner. The At-Home Interviewer conducts consumer research studies by phone. We represent major corporations in industries like automotive, financial, hospitality and telecommunications. We are an outbound call center with At-Home interviewers conducting survey questions via your equipment connected to our servers. Customer responses are generally inputted into the computer using numeric keys or the mouse. For Quality and Training purposes all calls are recorded. By using the employee’s reliable phone with clear reception, the MaritzCX dialer system contacts the customers automatically. There are never any long distance or local charges as a result of contacting respondents. In order to assure quality and consistency of every survey, Interviewers must follow directions, procedures, and instructions while also using time effectively. They must have minimal time off from their schedule. MaritzCX requires Internet not be used for non-work related purpose during working hours. This includes media streaming, gaming, or web usage by other members of household. No caring for anyone while at work including children, parents, etc. Employees must pass the paid training to be considered an At-Home Interviewer. Training includes interviewing techniques and procedures, customer sensitivity awareness, and company policies. You will attend either one 8-hr session or two 4-hours sessions. We start at your state/county minimum wage/hr. Other wage increase opportunities may be given at time of performance appraisals (2 month, 6 month and yearly after two years of employment). *The minimum weekday shift is 4 hours. The maximum weekday shift is 6 hours. Submit application hours based on your specific time zone. You can email me at virtual.sc@maritzcx.com with any questions or for application and job description. I presume the interviewer position is different than a call center position? Do you absolutely need a land line? (I would need to purchase a home line, just checking for budgetary reasons). Is the training for interviewer an online training? This position sounds perfect for me. Hi everyone! I amt eh recruiter for Maritz. I wanted to give some information on some of the questions I’ve seen. Upon receipt, your application will be reviewed and if you meet the criteria, you will be invited to complete the online Basic Skills Assessment. We will send you a link that will connect you to the assessment and to a voicemail system that will record you reading scripts, word lists, phonetics and names. The Basic Skills Assessment will need to be completed within 5 days of the invitation. We will review your performance and contact you regarding the results within 3 days. If the test result met our needs you will be interviewed for the At Home Interviewer Position by phone. If a position is offered based on the interview, we will conduct a employment verification and invite you to attend a New Hire Training Class dependent on validation of employment. Our general hours of project operations are Monday through Friday 2-9 and Saturday and Sunday 9-5 Pacific Standard Time. Hours may vary based on project requirements. *The minimum weekday shift is 4 hours. The maximum weekday shift is 5 hours. Sunday: We currently do not have any projects operating on Sundays. The position is paid minimum wage with potential increases after 30 days. Other incentives would be discussed in orientation. Thanks for stopping by, Andi. I appreciate the additional info! Thank you for informing your readers about these positions. I have been reading your website for months. I was quickly hired be Maritz. The training took place all day on a Saturday. I was working the following Monday. I was paid by direct deposit the next week. They hold back pay only one week. The work is easy because I have customer service experience. They hired me at the minimum wage rate of my state. I am promised an automatic $0.50 increase after 30 days of not being Absent or Tardy. As far as I am informed the hours are 5:00 pm-10:00 pm EST which is 2:00 pm- 7:00 pm PST. They go by Pacific time. So far, the only drawback is I not completed most shifts. They often run out of telephone numbers. But, this has never ever happened on a Saturday. Thank you for the additional information, I know it will be helpful to readers. And congrats on getting hired! Not too many people have computers with Microsoft 2000 running on it, unless they are doing this through a remote computer service. Will this hinder anyone from applying or getting the job? I don’t think that will hinder you — they may just mean Microsoft 2000 or later. Like you said, very few people are still running that software anymore, so definitely apply anyway. On the job description it says a requirement is Microsoft 2000. Does anyone working for Maritz know if they accept other programs like Open office? I currently work for Maritz research as a phone interviewer. I have been with them for over one year. It is not a bad part time job. You do have to read the script verbatim. Some times you do get a lot of nasty people, but I do not take it personal. I am glad that Maritz pays every week on Fridays and that there is no selling involved. I was interviewed and hired by maritz, however when i got to orientation the lady conducting the orientation was not at all professional. She made some really ugly remarks toward me and then kicked me out of the process and said I didn’t meet the requirements. Of course she blamed the whole situation on me. I did get a call from the Senior Manager, but she stated that their decision to let me go was standing. I didn’t understand the whole dilemma, and am still left frustrated with this company. Why were you kicked from orientation? You only told your side and Im sure they didnt kick you for no reason. I am very ill learning that Maritz has let me down in steady income. I wouldnt blame them, but perhaps the project I was working on. I am once again unemployed until mid January or February where they asked us to take unpaid time off. I have no other job and not sure if i qualify for unemployment being that I only worked there for 3 months. Im lost, confused, sad, angry and cant pay bills! I really thought from all the good reviews that this job would be steady until I find another source of income to move out my parents home. Sadly, im trying to figure out how to keep the lights on and figure out how im going to eat once again. Im angry because i thought I was going to get out the slump and once again another work at home company have sudden shut down and now a number of people (not all only those on this particular project) are out of the job. What makes it even worse, they pick and choose people to do breifing for other projects so they can still work and make money. I don’t like this treatment, im angry because im broke again, poor and trying to figure out how to keep my cell phone, landline and internet on for the next month in hopes that the other jobs I applied for can contact me. Anna T, you are not considered an Independent Contractor with this company. We are employees. Thanks for the websites, I will check them out asap. That’s right, I apologize. There are so many where you are an IC that I get them confused. Hi, nice share! is this position available worldwide? Unfortunately I think this one is for US only. Thank you very much for posting this information regarding this job. I am so glad that I saw this. Luckily, this company is located in my city and I am familiar with it. I just didn’t know that they also hired at home workers. I applied and sent it this morning and within 1 hour, I was told that I have an interview with them. I am crossing my fingers to get the job. I’m just curious if we are required to work holidays and if so, do we get paid holiday pay for it. I guess I am curious about it since it’s almost Thanksgiving and Christmas and I saw some jobs that do require you to work on holidays. Other than that, Allison, thank you for the information as well. I put you down as my reference 🙂 I have a 5 month old baby, but I am sure that I can work around her sleep schedule. I hope that everything goes well next week. Good luck on your interview, TC! I hope you get it! Our Supervisor has given us permission to post the following information on this board. If you are interested please apply for the following position, and we are being informed to ask everyone we recommend to use our name in the “Referred By” Section of the application. Maritz Research conducts consumer research studies by phone. We represent major corporations in industries like automotive, financial, and telecommunications. We are an outbound call center with At-Home interviewers conducting survey questions which are to be read exactly as they are seen. Customer responses are generally inputted into the computer using numeric keys or the mouse. For Quality and Training purposes all calls are recorded. By using the employee’s reliable phone with clear reception, the Maritz dialer system contacts the customers automatically. There is never any long distance or local charges as a result of doing this position. In order to assure Quality and Consistency of every survey, Interviewers must follow directions, procedures, and instructions exactly while also using time effectively. They must have minimal time off from their schedule. We do not accept applicants currently working for other Market Research industries. If discovered during employment, termination will be effective immediately. Employees must pass the paid training to be considered an At Home Interviewer. Training includes interviewing techniques and procedures, customer sensitivity awareness, and company policies. 30 day perfect attendance = $.25 increase. Quality and Production objectives met = $.50 increase. Monday – Friday 1:00-9:00pm; 4-8 hours/shift. Latest shift start is 4:00pm. Saturday 8:00-5:00pm, Sunday 9:00-5:00pm; 3-8 hours/shift. Latest start is 10am. 20 hours/week requirement, 28 hours max. 6 hours every weekend. No exceptions, sorry. Thank you for your Excellent explanation. It is very helpful !! One question: Any hints on the types of questions used in the interview? I applied and got an interview request email in the middle of the night after 1 am on Friday requesting an interview for this week. Well, since it was technically Friday morning, the email did mention that they can schedule an interview for next week as well, I put down Tuesday and the three times that I could choose. I hope to hear back from them at an appropriate time this time.